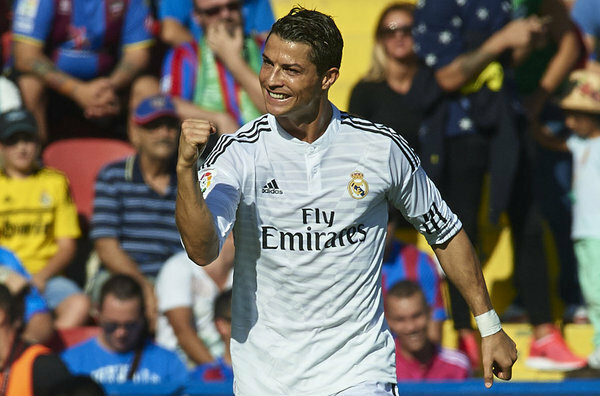 The easy life of playing in the Spanish La Liga continues, as Cristiano Ronaldo improves his scoring record with a 5-0 win over Levante. The top scorer in Spain and Europe had a double, aided by strikes from Javier Hernandez, Isco and James Rodriguez. And so, after almost two weeks without football and just before their big Champions League match with Liverpool, Real Madrid do very well in a stadium that hasn’t always been too welcoming to them. Things went comfortably right from the start, and a 2-0 lead at half time meant there wasn’t too many testy moments for the favorites. Cristiano Ronaldo reached 15 goals in seven league matches, scoring the opener from the penalty spot after Hernandez did a good job of selling the foul, and later on Ronaldo added his second of the match, scoring off of a typical counter attack from Real Madrid, the assist provided by Isco. Isco himself, after a rough debut season and somewhat losing his place in the rotation early on in this year had a fine match, which included scoring the fifth goal in the 82nd minute, with Hernandez, doing a great job on his time away from England, setting him up. Hernandez scored the second goal in the match to make things a lot calmer going into the locker room before half time, getting James Rodriguez’ cross from a corner turned into a goal. Rodriguez, recovering from his frustrating first month with the team, scored one as well in the 66th minute after a brilliant assist from Toni Kroos.